Love them or hate them, code enforcement affects every landlord. Many cities, including Sacramento, have annual inspections by the local governmental rental housing agency. Some cities allow you to self certify, but will do random spot checks to verify compliance with rental housing codes. The City of Sacramento’s goal is to inspect every rental property every five years. In a report released by Sacramento Rental Housing authority, over 15,000 code violations were found in one year. On average, 46% of the rentals inspected had violations. Most of these violations were related to plumbing, electrical and leaking sewer issues. In this article, we look at the most common code enforcement violations reported and what you can do to solve them. Smoke and carbon monoxide detectors are the number one code enforcement violation. Everyone knows how important smoke detectors are in saving lives. And most landlords have at least one smoke detector in their rentals. However, every bedroom must have a functioning smoke detector. Additionally a smoke detector is required outside of each sleeping area and must be installed within 12 inches of the ceiling. Carbon monoxide alarms must be installed four feet or less from the floor, but not near an air register. Does your home have multiple levels? You need to have a smoke detector and carbon monoxide detector on each floor level. The problem many landlords face, come from tenants who remove the batteries. Christmas morning comes, and little Jonnie’s race car needs a 9 volt battery. “Oh, I know where I can get a battery. I’ll buy another one at the store later to replace it.” Unfortunately, people forget and you’re left with a potential code violation. Newer smoke and carbon monoxide alarms come with non removable batteries. These newer alarms have a 10 year battery reducing battery replacement problems. Most of these alarms also have a place to write the installation and replacement dates on the side of the alarm. It’s a good idea to look at these dates once a year to know if they you need to replace them. Plumbing violations come in the form of lack of hot water and improperly installed hot water heaters. Gas water heaters in garages must be elevated 18 inches off of the floor to prevent the accidental ignition of gasoline and solvent fumes. In addition, California requires all hot water heaters have seismic straps in two locations to prevent shifting or falling during an earthquake. These straps must be placed approximately one third of the way down from the top and one third of the way up from the bottom. It is important to note that if your hot water heater is gas, the seismic strap should be at least 4 inches above the lower gas pilot opening. In addition to missing earthquake straps, another common code violation is improper venting. In the event your hot water heater gets overheated, the steam and water need a place to escape safely. This is what the Temperature and Pressure (T&P valve) relief valve is for. The Temperature and Pressure valve can be found toward the top of the hot water heater. It should connect to rigid piping to drain the water and steam outside of the home. 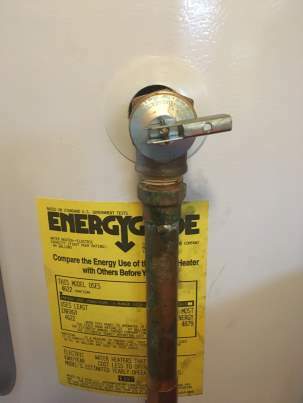 Installing new hot water heater? Be sure to install a pressure relief tank too. It will prevent excess pressure from back flowing into the home. Sometimes lining up the plumbing in a new sink can be a pain. You’re walking down the plumbing aisle at your local big box store and you see what looks like the perfect solution. Flexible pipe. It’s even advertised as the solution to what you’re looking for. The only problem, it’s not up to code and your tenants’ junk under the sink will probably knock the connections loose. Instead, you should use black ABS pipe glued together. It’s much more solid and won’t trigger a code violation if done properly. Electrical problems include items such as broken or inoperable light switches and missing or faulty GFCI outlets in bathrooms and kitchens. This includes missing or broken electrical cover plates. Each bathroom receptacle must be protected by a GFCI circuit. Most bathrooms have these, even in older homes. The problem is GFCI circuits are known to fail when they get old. Normally you can just push the test button on the circuit. However, sometimes the push button breaks and isn’t always sufficient to determine if the circuit in working. Instead, buy yourself a GFCI receptacle tester at your local hardware store. You can use it to test both the GFCI functionality in your bathrooms, as well as testing the other receptacles in your rental property. Did I forget to mention that all your receptacles must be in operable condition with cover plates to pass your rental housing inspections? Another common code violation is the use of extension cords as permanent wiring. How many times have we seen extension cords run across the top of the garage rafters to hook up the garage door opener? Sometimes, you might even find that someone has cut off the ends of the extension cord and connected the wires to another wire using wire nuts. This is an electrical no-no and is sure to trigger a code enforcement citation. All electrical connections must be enclosed in a proper electrical box with the appropriate cover attached. In addition, to being in a junction box, all connections must be accessible. This means they cannot be hidden behind sheet rock or inside the wall. Years ago, we bought a property that had an intermittent electrical problem. After extensive troubleshooting, we discovered the source of the problem. A previous owner had made an electrical connection inside a wall, without a junction box and covered it with sheet rock. We had no way of knowing there was a connection in the wall without using special tools to trace the wires in the wall. If the panel has had circuit breakers replaced, it may leave voids in the cover that need to be filled. You can buy electrical panel blanks at most local hardware stores. These blanks fill the voids left by changes in your electrical panel and typically snap into place preventing someone from sticking their fingers inside accidentally. Each unit must have a permanent and functioning source for heat. This rules out using portable space heaters as the only heat source. Furnaces can be very expensive to replace and can eat up any positive monthly cash flow your rental may have. While California does not require a home to have air conditioning, states in hotter climates, such as Arizona do. In addition, functioning heat is considered a priority violation which means you cannot put it off. Bathrooms that do not have sufficient ventilation can cause moisture problems and are a habitat for mildew and mold. Lack of sufficient ventilation will trigger a code violation. It could also result in the landlord having to put the tenant up in a hotel while the problem is remediated. In the past, bathrooms were required to have an exterior window or a functioning bath fan. Today, California is requiring a bathroom fan in every bathroom in new construction homes. After years of use, bath fans can be come filled with lint and hair that need to be removed. When you have a vacancy, it’s a good time to blow the fan out with an air compressor or shop vacuum to keep these in good working order. If your rental property is on a raised foundation, it probably has vent screens for air flow under the house. If the vent screens or crawl space covers are missing or in disrepair, they will also trigger a citation. Sometimes wires or pipes get pushed through these screens, leaving holes for rodents to enter under the home. Exterior crawl entrances can also be damaged from years of opening and closing, or simply missing. A mouse can crawl through a hole as small as a dime, so keep these holes sealed. It’s not just the screens under the home. Your attic eves vents should also be screened to prevent pests from entering the home. They should also remain unobstructed and unclogged. These vents help protect the home from mildew and unnecessary moisture buildup by allowing air circulation above and below your home. In a 2018 ranking by Orkin of the top 50 cities with rat problems, Sacramento came in 37th. Rats, mice, and other insect infestations can trigger a code enforcement violation. Rodents bring disease and can eat through walls and electrical wiring to get to food sources. Unfortunately, rodent problems are often caused by tenants or neighbors leaving food or piles of trash around the house. But it’s not just food they’re after. They’re looking for safety. Vacant homes and piles of stuff all provide attractive places for rodents to hide. Most rodent problems can be reduced if not eliminated by de-cluttering and cleaning up the landscape. You may not have too much control over your tenants tidiness. However, you can trim back trees and bushes that allow squirrels and other rodents access to the roof and vents in your rental property. Tree limbs should be trimmed back a minimum of five feet from the house to keep rodents from being able to jump onto your home. While you’re at it, find a different storage place for those things that are leaned or stacked up against the house. While you’re at it, seal up any holes to the property larger than a dime. A mouse can enter a hole the size of a dime, and a rat can enter a hole the size of a quarter, according to Orkin. If you observe clutter and debris during your annual inspection, it might be time to send a letter to your tenants to clean the property up. What if your tenants refuse to clean up their mess? If you’re brave, you may can contact code enforcement regarding trash around the home. Code enforcement will send you a letter of course. However, you will now have something official to show your tenant that they must clean up their act, or risk eviction. Inadequate weather proofing includes items such as cracked or broken windows, or doors and windows that do not shut completely. It also includes leaking roofs, doors and windows that do not seal correctly or have missing weather stripping. In California, tenants have an implied warranty of habitability. This allows tenants to withhold rent until the problem is corrected, fix themselves and deduct the cost from the rent, sue the landlord, or break the lease. This means if your rental has a leaking roof, and you don’t fix it, you may find yourself in court. Courts in California have ordered landlords to provide alternative housing for their tenants until the problem is corrected. If your rental property has security bars over the windows, you need to be sure the bars are releasable from inside. Some jurisdictions even dictate that the release mechanism is reachable from the floor by a child. If your rental property has security bars over the windows, make sure they’re operable. If they don’t meet code, it might be safer and easier to just remove them. Just make sure you remove them during a vacancy, rather than when you have a tenant living in the home. This refers to doors exiting your home that have locks that can only be unlocked using a key from the inside. You occasionally see this in older homes or where a parent wanted to make sure their toddler didn’t open the front door accidentally. However, in the event of a fire or other emergency, any occupants would need the key to exit the home safely. Leaving the key in the lock is not a valid alternative to replacing the locks. These locks should be changed out with locks that only require a key from the exterior of the home. Most can be replaced with simple dead bolts that have a latch of some type to open from the inside. Speaking of the front door, Sacramento requires a peep hole in the front door with a 180 degree field of view and to be no more than 54 inches from the interior floor. Hand rails must be securely anchored and cannot have any gaps greater than four inches between the bars. They must also be a minimum of 42 inches in height. You can buy handrails from the local big box hardware store. However, these rails often are not tall enough to meet code or have gaps that are too large. Some cities separate priority and non priority violations. What happens when code violations are found? What happens next depends on the local ordinances and whether or not your violation is a priority or non priority. The procedure for priority violations will vary slightly depending upon the violation and city. A violation notice will typically be posted on the front door of the property. This notice will contain the reason and the contact information for the officer who inspected the property. Start by contacting the code enforcement officer to determine what they will accept as a solution to the violation. Be prepared to wait a day or so to hear back from code inspectors. They are often out of the office and in the field for the majority of their day. Don’t be defensive or angry with them. Usually, they can be reasoned with as long as you are serious about solving the problem quickly. But don’t put it off. Priority violations must be corrected immediately as they typically impact the health and safety of the public. The procedure for non priority violations typically involves a letter from code enforcement to the property owner advising them of the problem. The property owner then has 30 days to correct the violation. In some cases, a code enforcement inspector may be required to inspect the property. If an inspection is required, you can be sure there will be fee charged for the visit. If your rental has been cited for violations, you have few options. Just because someone complains to code enforcement, doesn’t mean that there’s actually a violation. Tenants are notorious for being live-in housing inspectors. If you are cited for a violation that you believe does not exist, your violation notice will have more information about how you can appeal. Most violations fall under non-priority citations and will automatically have 30 days to comply. However, for more challenging problems, ask your assigned code enforcement officer if they have a compliance program that will allow you to follow a predetermined schedule to correct the problem. Don’t put off correcting the problem. The fines and fees can become insurmountable and the city can actually sue the landlord to correct the problem. Years ago we bought a home in Stockton, with over $11,000 in code enforcement fines. When reading the actual invoice for the fines, we discovered the city had invoiced the previous owner $125 for every time they drove by the property. To add insult to injury, the code enforcement officer never even get out of their car! If you are sued in California, the courts have the power to force you to pay for alternative housing while the violations are corrected. If you have a property you can also sell it. Whereas most end users would not want to purchase this kind of situation, it’s a great fit for investors. These cash buyers often buy these kinds of properties. Of course, you still have to disclose the code violations, but the great thing about these buyers is they typically buy as-is. This means you don’t have to correct the problem, and can sell your house quickly and easily. Do you need to sell a property with code violations? We buy houses with code violations. Complete the form below for a cash offer.